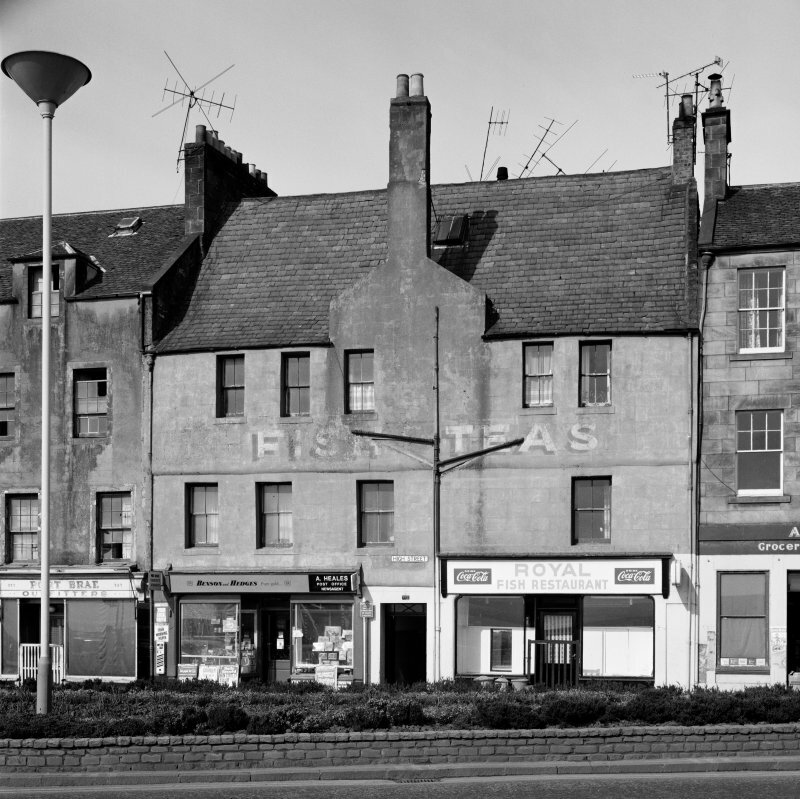 NT 2833 9180 An archaeological excavation and survey by Kirkdale Archaeology was completed on the site of the Merchant's House at 339-343 High Street, Kirkcaldy, in April and May of 1997. Specialist structural advice was provided by the School of Building Science at Heriot Watt University. The present house was built toward the end of the 16th century, and now belongs to the Scottish Historic Buildings Trust, who are actively engaged in its refurbishment and restoration. Surviving within the house are fine examples of 17th-century plaster ceilings, with earlier painted ceilings preserved beneath these, and extensive 18th-century panelling along some of the walls. The N wall of the second-floor interior also contains a mural depicting a late 16th or early 17th-century galleon. Large stone fireplaces survive in the N wall, with added gable chimneys in the E and W walls. The house is presently accessed via a central pend leading to a turnpike stair adjoining the house to the N, but there is some evidence to suggest that this had replaced an original stair in the S facade of the building. The aim of the recent fieldwork was twofold. Firstly the house was to be textually, graphically and photographically recorded, with the second element comprising the excavation of the ground-floor deposits and the archaeological investigation of the garden and yard to the N of the house. The garden excavations revealed that a substantial depth of topsoil had been imported in the 19th century, sealing the earlier 17th and 18th-century garden horizons. Bee-boles were recorded in the long walls of the garden, a fairly typical feature in coastal Fife towns of this date. The excavation within the interior revealed a system of drains and dwarf walls, alongside evidence for a series of uprights along the S facade of the present house. Pre-1500	Settlement at or near the present house site, with activity on the natural slope to the (site) N of the house. 1500-1550	The first house, possibly single storey. 1550-1600	First version of the present layout/structure. Ground floor with two upper floors, no attic space. Evidence of upright elements at ground floor on the S, W and E sides. External stair on S side. Two chambers at ground-floor level, kitchen to the E and service space to the W.
1600-1660	Sub-division of the main rooms, addition of the painted ceilings and new fireplaces in the gables. Creation of attic space. Transition from open area to more discrete chambers. 1660-1800	Extensive panelling and plaster ceilings at first and second floor. Remodelled S stair and extension of the E, W and S walls at ground-floor level. Addition of the E and W ranges. Rationalisation of the back-lot to form semi-formal gardens with bee-boles, etc. Further sub-division of the ground-floor rooms, and possible conversion of the kitchen to commercial/industrial use. 1800-1840	Creation of the ground-floor pend, removal of the S stair and its replacement with the N turnpike stair. Multi-occupancy of the house. 1840-1966	Continued multiple occupancy and establishment of a sequence of shops at ground-floor level. 1966-1993	Gradual decline in the condition of the property prior to the programme of restoration and recording. Sponsor:	Scottish Historic Buildings Trust. 16th-century town house. Monitoring and building analysis was undertaken during ongoing restoration works between 2003 and 2005. Building on the survey works already completed and previously reported (DES 1997, 39-40), the second major phase of restoration involved recording during works to the interiors of the main range fronting onto the High Street, and general works to the two rear ranges and court behind. Early masonry structure - ?mid-16th century. The outline of the first archaeologically attested building on the site was defined - a N-S rectangular structure set back from the existing street frontage. The existing rear wall of the main range probably incorporates parts of this structure, as do the two gable walls to N and S where standing remains were recorded. At the SE and NE corners stumps of early street frontage windows remained in situ, with evidence for relieving arches over; in contrast to all later phases these were detailed with chamfered arises. They lay on the line of a N-S masonry footing previously excavated within the two present shop interiors. Parts of the existing ground floor ceiling structure to the N may survive from this phase. It is suggested that the early structure dates to the 16th century. c 1580-1600. The early building was extensively remodelled at the end of the 16th century, attaining its present height of three full storeys and loft over. The existing street facade line, roof and floor structures date from this time. The building was ashlar-fronted, with fewer windows than at present and probably relatively simply appointed at ground floor level. An internal entrance led to a stone turnpike stair, the smaller windows of which still survive on the frontage. The internal arrangements of the building were largely deduced at each level for the first time, mainly as a result of the analysis of surviving woodwork and the extent of painted ceiling decoration. boarding with decorative edge mouldings, now seen within the loft space, was deduced to have originated within the main apartments at either first or second floor level. The building at this stage had two rear wings. While relatively little survived of the wing to the NE, the existing NW range was discovered to be relatively intact, even preserving parts of its roof structure. This evidence was employed in its restoration. the panelling, including false-graining to simulate rare woods and stones, particularly marble. At second floor level there were further grained interiors and, to the S, an interior with false-graining detailed with painted geometric marquetry, oystered inlay, and tortoiseshell-patterned mouldings of Dutch character. The re-ordered interior plans at this phase were also largely deduced. The first floor room to the S was expanded into the hall to the N, and to the W. At second floor level there were probable bed recesses at the NW and NE corners of the range. Mid-18th century. In the first floor chamber to the N, possible evidence for an original tapestry hanging was overlain by the surviving remnants of an early to mid-18th-century scheme of red flock wallpaper upon stretched canvas, associated with teal-blue painted panelling elsewhere. Beginning of the 19th century. The end of the 18th century onwards saw a general decline in status, sub-division and tenant occupancy. The existing pend was inserted following the removal of the turnpike stair and the addition of a new stair tower to the rear. The pend gave better access to new commercial premises, including a bakery within the close to the rear. Sponsor: Scottish Historic Building Trust. To the east of the town are two important buildings (seep 45). 339-343 High Street is a sixteenth-century dwelling of significance, currently undergoing restoration by the Scottish Historic Buildings Trust. A three-storeyed building with a floored roof-space, its front exterior has undergone little change, other than new windows and doors being inserted and older ones blocked up, although the shops on the frontage are a major disruption. Originally, an internal stone spiral staircase was sited at the front of the house; the ground floor probably contained a kitchen at the east end; the first storey housed a large central hall with a massive fireplace and a chamber at each end; the second floor was probably of similar design. The original decorations also indicate that this was a dwelling of substance. The soffits of the second floor joists and boards were adorned with tempera painted designs, and there were pictorial decorations on the plastered walls, two of which at least survive-a lion, and a ship in full sail. In keeping with its continuing importance, the interior was modernised, possibly in the 1670s, with the addition of wooden panelling on internal partitions, and lath-and-plaster ceilings and cornices, the first floor ceilings being embellished with deep covings and decorative bands, roses and putti. Later internal changes altered its character: the front stair was taken down and a rear external staircase substituted; a pend was inserted right through the building; and there was a realignment of some rooms. External alterations created a west wing to the rear and added various outbuildings. This restoration project is a good example of the archaeological potential of historic standing buildings. 443-447 High Street (Sailors' Walk) may have originated as two dwellings. A characteristic seventeenth-century block, it probably incorporated an earlier building. Gables project to front and rear, the western gable being crow-stepped and corbelled out over the ground floor, while the roofs are pantiled, perhaps reflecting trading contacts with the Low Countries. In due course the building came to be divided into four dwellings. One of these, the East House, is approached by a turnpike staircase, and incorporates two interesting apartments. A rear room is finely panelled; another has a painted wooden ceiling, probably of early seventeenth-century origin, with arabesques and birds' and animals' heads on the boards, and biblical texts on the beams. An inscribed lintel over a fireplace bears the date 1676. A repositioned stone tablet bears the arms of Charles II. This was originally located on the east elevation. Both of these buildings throw light on Kirkcaldy's past. Their position outside the East Port and near the harbour suggests that, as has been proved for 339-343 High Street, both dwellings were the homes of wealthy merchants or shipowners. Their sites offered ready access to the port and perhaps an oversight of the owners' ships. (Could it be that the ship painting in 339-343 High Street was an illustration of the owner's own ship?) It is unlikely that these were the only prestigious dwellings in this area of the town. Development outwith the town port suggests that this suburb was becoming desirable in the sixteenth and seventeenth centuries because of the increasing economic importance of Kirkcaldy's harbour, in spite of the hubbub and dirt associated with a port. Cartographic evidence, moreover, indicates that burgage plots were wider here than in the central core of the town, which would also have attracted, and might indicate, prestigious building. The later subdivision of both houses, certainly by the early nineteenth century, into a number of tenements is partly a reflection of the area becoming socially less desirable. Manufacturing premises moved in towards the harbour region, and the wealthier elements of society opted to move to quieter suburbs, further removed from the industrial core of Kirkcaldy. Any refurbishment to these two standing buildings, the ground to the rear of the properties and the pend at 339-343 High Street, such as the insertion of new services, new floors or re-surfacing, would have archaeological implications. This might reveal, for example, successive floor levels associated with early phases of the buildings, or secondary structures attached to the rear of the properties. As both these buildings are situated outside the northern limit of the medieval burgh, any archaeological deposits that can be demonstrated to predate the construction of the standing building would also provide a date for the establishment of what may be a later suburb. Information from ‘Historic Kirkcaldy: The Archaeological Implications of Development’ (1995).